As I alluded to earlier, my wife and I were in Europe last month, and as described in a summary of our train journey across Europe (see the post at: http://modelingthesp.blogspot.com/2014/10/a-train-trip-across-europe.html ), we arranged to spend some time in York, England, so we could visit the National Railway Museum there. This is without doubt one of the best railway museums in the world, and in my opinion it clearly is the best. Not only is their collection of locomotives and rolling stock very large, not only does it include numerous pieces of historic significance and great age, not only are many of these pieces fully restored, but in addition the museum has the space to display many pieces (though the display changes regularly so that the treasures rotate through the space.) It is a marvelous place to visit, even if you don’t know all that much about British railways. In my own case, having lived in England during a sabbatical year, reading many books about British railway history in the process (and of course visiting York then), I know enough to appreciate what I see there. Many things besides locomotives and cars are on display. 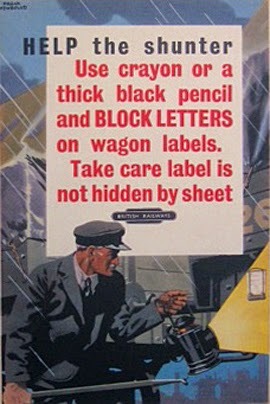 One example I enjoyed is this poster from British Railways days in the 1950s. It refers to “wagon labels,” what in North America are called route cards, used to inform switchmen (called “shunters”) of destinations of freight cars. Note that the shunter here, holding his shunting pole, is working in the rain and perhaps darkness. 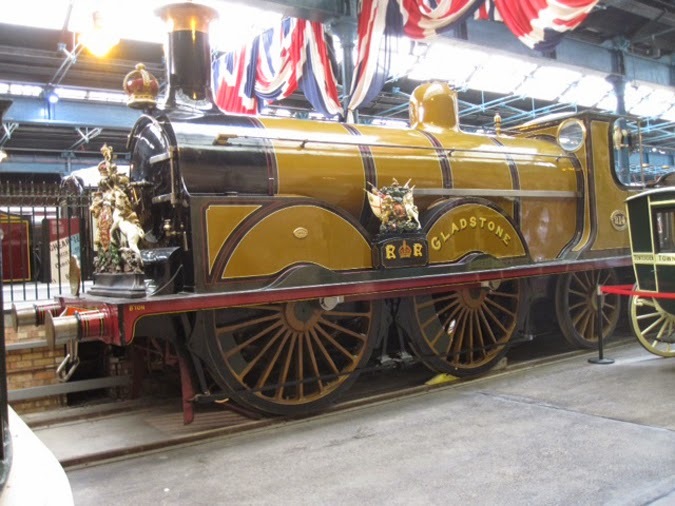 One good example of the kind of historical locomotive treasures in the collection is shown in this photo of “Gladstone,” first of the Class B1 engines built by William Stroudley of the London, Brighton & South Coast Railway between 1882 and 1891, with an 0-4-2 wheel arrangement. The paint scheme, with its bright colors and intricate lining and banding, is typical of many British railways in the 19th century and well into the 20th century. Another dramatic 19th century locomotive design is shown by this “single driver” example (meaning, of course, one driving axle), with 4-2-2 wheel arrangement, one of the 95 such engines, designed by Samuel W. Johnson and built for the Midland Railway during 1887–1900. Locomotive 673 (originally 115 class) is shown painted in the Midland’s crimson-lake livery. It is posed alongside a high-level platform. Perhaps the best known of the British railways prior to the nationalization into British Railways in 1948 was the Great Western Railway. Its dark green livery, nearly as dark as the Pennsylvania Railroad’s locomotive color, along with Belpaire boilers, makes its locomotives easy to recognize, and many classes of GWR engines were notable technical successes. Posed on the Great Hall turntable the day I was there was “City of Truro,” a famous 4-4-0 locomotive which achieved a speed record in 1904 of close to 100 miles per hour. This is among the first of G.J. Churchward’s many remarkable designs for the GWR, making him among the most respected locomotive designers in British history. 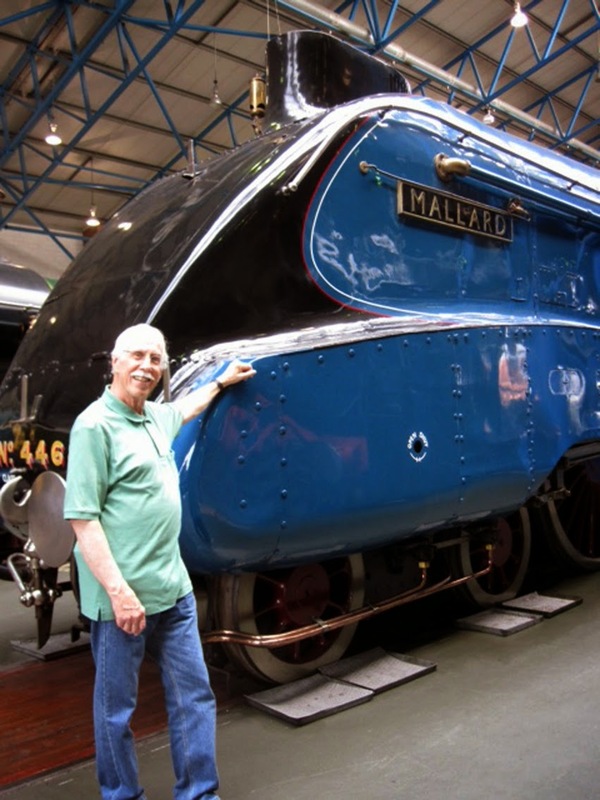 But the real treasure for me in the collection is one of Sir Nigel Gresley’s streamlined A4 Pacifics, originally 35 locomotives built during 1935–1938 for the London & North Eastern Railway (LNER). 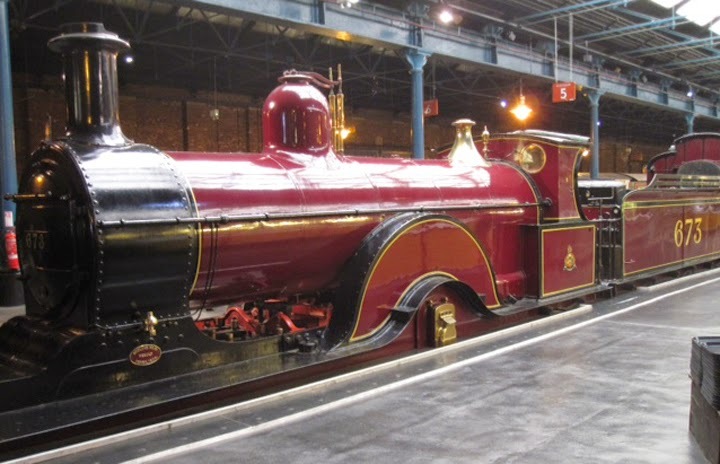 Six of these outstanding engines survive in various museums today, and all six were reunited in Britain during 2013 and 2014. 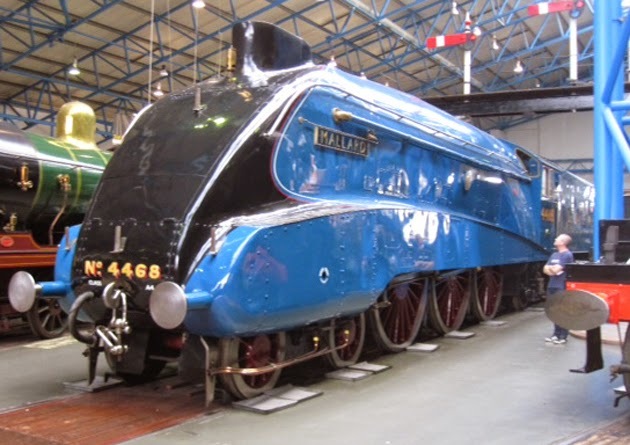 The most notable is surely NRM’s “Mallard,” still the world speed record holder for steam power, 126 mph in 1938. This view of the locomotive suffers somewhat from the fact that locomotives of any size are pretty hard to photograph in the exhibit space! This is the “Garter blue” paint scheme which is probably the most famous A4 paint scheme, standard for express passenger engines in the late 1930s on LNER. What a great experience to re-visit this brilliant museum. It was a genuine highlight of my entire trip to Europe. I have described prototype empty car bills in previous posts, and some of those posts are listed below. In this post I return to that topic, and also discuss modeling implementation of these bills. It may be the case that there were a few American railroads (I don’t know about Canadian or Mexican practice here) which did not use empty car waybills. But evidence continues to emerge for more and more railroads that did use them. Below is a scan of an original manila cardstock document from the Missouri-Kansas-Texas (MKT) which is 3.5 x 9 inches in size. You can click on it to enlarge the image. Of perhaps equal importance, at the bottom was this admonition, which clearly describes the importance of this document. 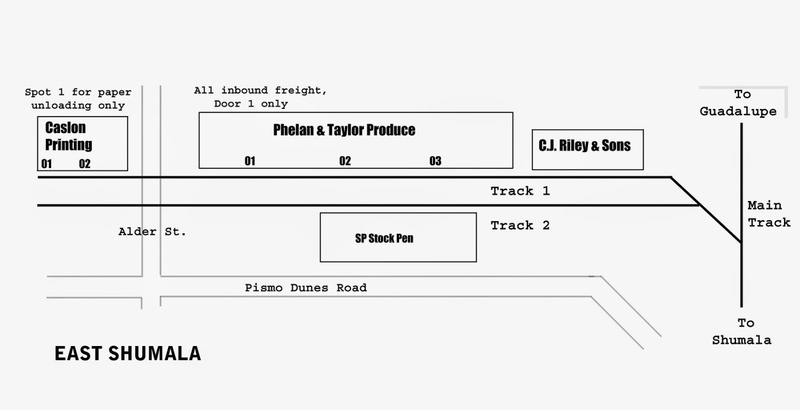 The exceptions, tank cars and some refrigerator cars, are also noted and their movement documentation listed. This sentence might be a good addition to a model Empty Car bill. I also obtained an Atlantic Coast Line card of the same type. It too is cardstock, of a somewhat ocher color, and is 3.5 x 8.5 inches in size. It is similar on its front face to documents I have shown in some of the earlier posts whose links are shown above. The back face, however, is also interesting in that a summary of some of the relevant Car Service Rules are printed there. This also is certainly an option for addition to model documents of this type. Note that at the bottom of this document back is a comment about Special Car Order (SCO) 90. For post-1953 layouts, this might be a good addition also. 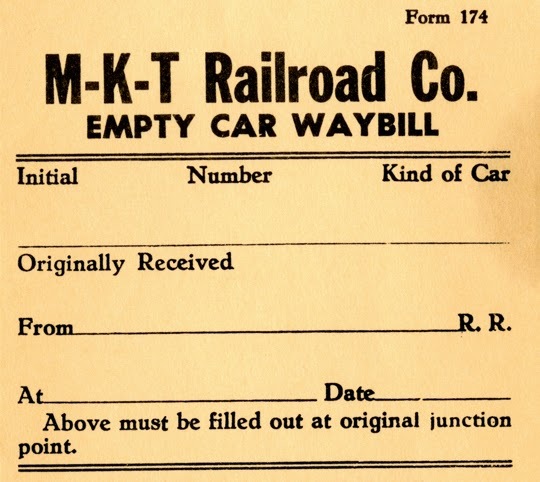 Use of these kinds of Empty Car billing documents is slowly increasing on model railroads interested in prototype operation, instead of merely having a four-cycle card with a couple of moves simply identified as “empty.” This is another of those small changes to make operation more realistic. I have written in a previous post about upgrading some aspects of the old Athearn metal box car models. (You can read that prior post at this link: http://modelingthesp.blogspot.com/2011/09/upgrading-old-models-4.html .) The work I described there was about the underframe and running board, so I won’t repeat that, except to say that the present model also had a running board problem, not only in that the rather thick Athearn white metal casting was broken, but that it poorly represented a steel grid running board. I replaced it with scale 1 x 6-inch stripwood and cast metal lateral running boards. To go about renumbering the car, I had to contemplate the fairly heavy, “dusty” weathering I had applied. The obvious solution was to “patch” the paint, just as the prototype does when reweighing requires new capacity data to be applied. I simply brush-painted rectangles to cover up the old car number (along with the capacity data), and to cover the wrong class number, while also providing fresh paint on which to apply reweigh and repack stencils. Here is the car at this point. The roof and ends need to receive additional weathering to conform to the look of the car sides. The stamped metal ladders and metal sill steps look good even by today’s standards, and the door, though not well detailed, is satisfactorily thin and has the right features in general. The end supports for the running board are not yet applied. You can see that a brake service stencil has been applied to the reservoir; decals are supplied in the Speedwitch set. I have discussed brake service stencils elsewhere, available at: http://modelingthesp.blogspot.com/2014/04/brake-service-rules-part-2.html . I wanted these paint patches to look slightly less than new, so while weathering the car roof, I used a very light acrylic wash to genttly dirty the new lettering. Here the objective was only to make the new side and end lettering less “clean white” (except for the reweigh, repack, and brake service stencils). Here is a side view to show what I mean, which can be compared to the as-decaled shot above. The car is spotted in front of a reefer being iced at Shumala on my layout. This small project was only a way to have this model correctly numbered for the car body that it is. Modeling features otherwise are little changed except for a couple of minor upgrades. The point is to show that this kind of “paint patch” may be the solution to lettering or numbering problems you might encounter with models. My first five posts in this series described the basic method using acrylic paint in the form of washes. Part 6 discussed weathering of flat cars and covered hoppers, and contained links to all five of the introductory posts; it can be found here: http://modelingthesp.blogspot.com/2014/10/my-acrylic-weathering-method-part-6.html . Part 7 addressed gondolas and hoppers, and Part 8 took up the special challenges of lighter-colored cars such as refrigerators. Links to both are below. 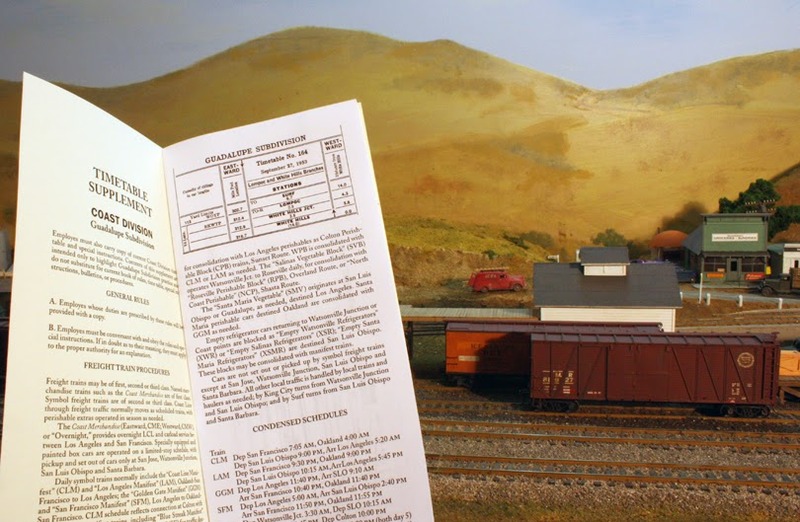 Some readers of these posts will have seen the November issue of Model Railroader magazine, with several articles on weathering. The one by M.R. Snell on freight cars, curiously, only addresses covered hoppers, presenting three methods. One of these uses acrylic paint, not washes as I use, and really describes painting the car sides. This is a far different technique than I have been illustrating in this series. In the present post, I discuss some of the details of the weathering process. These are all little things, but things that really can make a difference in how a model looks. All are based on prototype photos, and are part of the effort to reproduce what is seen there. One thing to do prior to overall wash weathering is to emphasize boards in wood parts of cars. Cars with wood sheathing, wood running boards, or wood roofs, typically weathered a little unevenly, as the individual boards held paint a little differently. One way to bring this out is the use of artist’s color pencils. There are several brands of these, and both my and Richard Hendrickson’s experience is the the Prismacolor brand works well. Some other brands do not. In our joint clinic on weathering, Richard and I showed examples of the use of pencils. Following are some photos from that clinic. A brief summary of our clinic, in the form of a handout, is available at the following link: http://modelingthesp.blogspot.com/2011/10/weathering-clinic-handout.html . Here is a photo showing the process of varying the color of a painted running board. Such variations definitely do show up in prototype roof photos. You can click to enlarge. The same applies to wood sheathing, especially on light-colored cars like refrigerator cars. Again, remember that the overall weathering comes later, and these perhaps exaggerated streaks will then be less evident. Another place the Prismacolor pencils can be effective is on stock cars, and here again, individual boards can weather differently from each other. 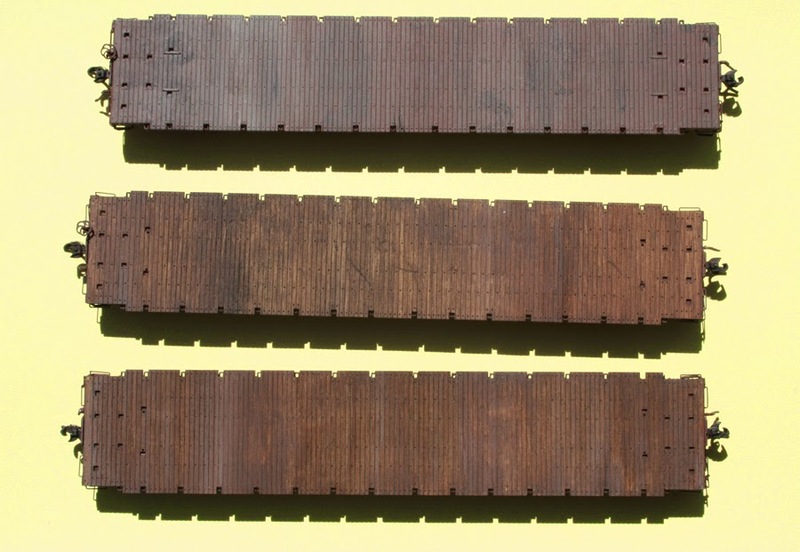 Vary the color of some boards with the pencils prior to overall weathering. Another point: stock cars were cleaned between all runs, often steam cleaned, and many prototype photos show their paint as faded. (They most certainly did not show staining from manure, old straw bedding, or other carry-overs from the previous trip, as any shipper would have rejected such a car as insufficiently clean for movement of his stock.) Here is a model example of the kind of fading I mean. The car is a Red Caboose product. Another example of how effectively stock cars can be faded and weathered is shown in this photo of a Santa Fe class SK-T car, modeled by Santa Fe modeler Michael Gross (photographed by him and the photo used by Richard and me with his permission). Board to board color variations are visible here. I also like his subtle paint failure on the roof. This effect is easy to caricature, but here Michael has done it very effectively. The use of pencils, as shown in these few examples, is just one of the ways to make weathering more detailed and more effective, particularly if it is kept subtle. Ideally the viewer likes the “look” of the model without being hammered over the head with specific effects, and that is the result we are striving for. I will continue with additional details in a forthcoming post to continue Part 9. In this eighth part of my series on acrylic weathering, I want to concentrate on the problems of light-colored cars with this method. The most common type with such paint is the refrigerator car, but the same considerations apply to any light-colored car, including tank cars. Links to the first five posts in the series, describing the basic method, can be found in my sixth post, at: http://modelingthesp.blogspot.com/2014/10/my-acrylic-weathering-method-part-6.html . I should begin by repeating something I have said in previous posts, that reefers certainly did get pretty dirty in service, and it was quite noticeable on their light-colored sides. I discussed earlier several aspects of modeling Pacific Fruit Express (PFE) reefers in 1953, and in Part 2 of that thread, talked about grime accumulation and showed some photos. You can read that post at: http://modelingthesp.blogspot.com/2011/03/modeling-pfe-reefers-in-1953-2.html .Here is another prototype shot to illustrate the point, of how varied these cars could look in service. It is a John E. Shaw photo, taken at Green River, Wyoming on Sept. 3, 1955, used with permission. You can click on the image to enlarge it. The variation from car to car of this all-PFE train is something few modelers, including me, have accomplished, though I keep trying. Of course, not every car is severely dirty. Cars did get repainted, and some car owners, notably PFE, did wash cars whenever their grime was getting excessive, on average about every four to five years. For that reason, PFE car weathering cannot simply be scaled with the age of the paint scheme, because an older paint scheme may have been washed recently, and the car might then appear cleaner than a more recent paint scheme. Numerous statistics on PFE car washing can be found in the PFE book (Pacific Fruit Express, 2nd Edition, by Thompson, Church and Jones, Signature Press, 2000). The Fruit Growers car shown below is intended to depict a car which is moderately dirty. But it is realistic as well as fun to try for seriously dirty cars too. Here are three of my recent PFE weathering efforts, ranging from very light on the car at right, to fairly dirty at left. Some time back, Richard Hendrickson sent me a photo of several of his PFE cars, and as you can see, one of them is truly dirty, while the one at far right was new in Richard’s modeling year of 1947. But this dirtiest car is not beyond what is visible in color photos, so it might be a desirable end point for any weathering program. I have continued to work on variations in weathering on light reefer paint schemes. 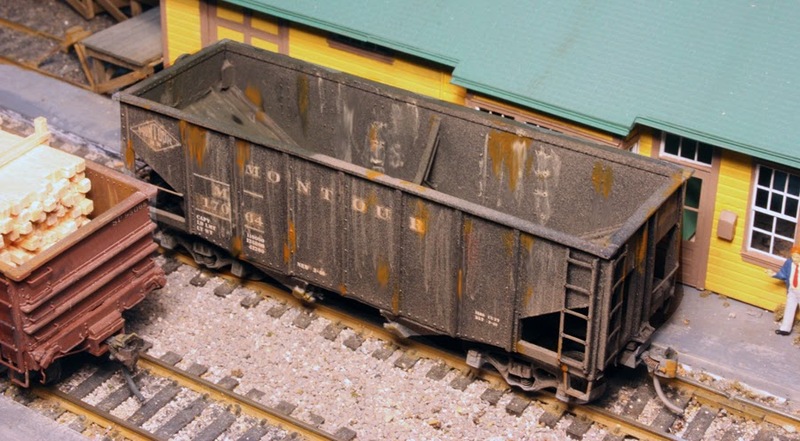 As an illustrative example, here is a private owner car with a medium amount of weathering. 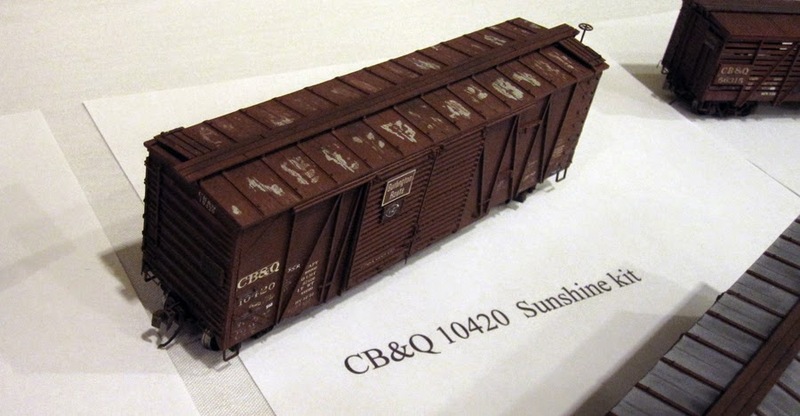 This model of an AC&F-built reefer is from a Westerfield kit. Finally, I should say something about salt staining on reefers. Heavy salt was often used with loads of meat and packing house products, but if used at all with produce, was far less, for example 5 percent vs. 30 percent. 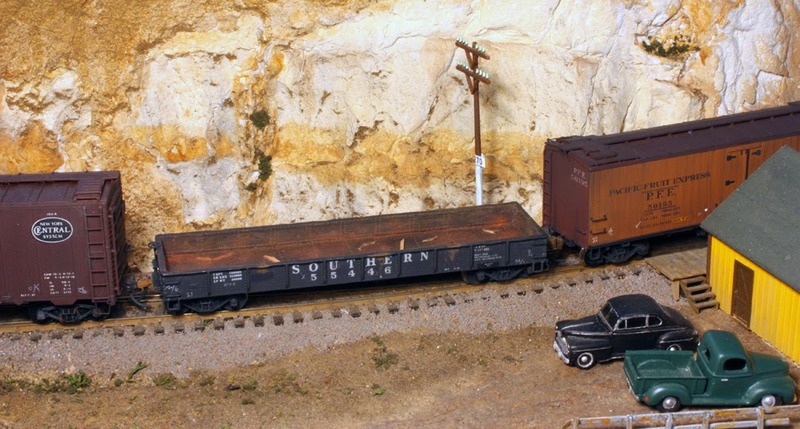 For that reason, I would advise modeling salt stains near ice hatches only on meat reefers, like this Swift car modeled by Richard Hendrickson. As you will find if you experiment, getting a uniform acrylic weathering coat over a light color takes some care. Of course it can be done and with practice, I think anyone can do it, but it does require some extra attention. I have just returned from this year’s Naperville (Lisle) meeting. 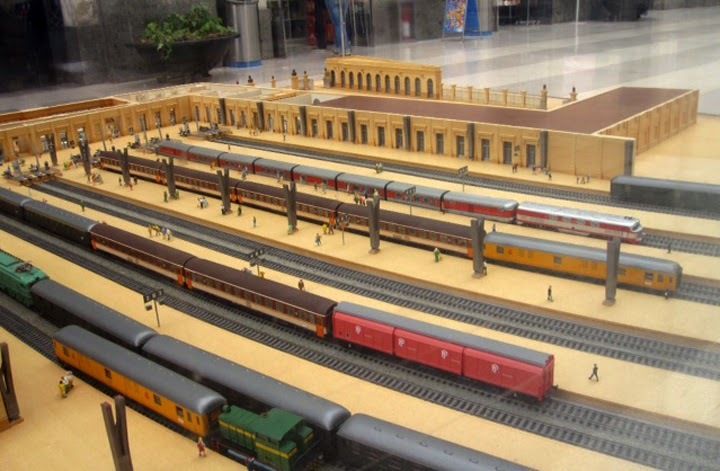 The annual Railroad Prototype Modelers meeting, long located in Naperville, Illinois in October of each year, has in recent years been held in a hotel in neighboring Lisle, Illinois, a few hundred yards outside the Naperville line. Accordingly many still call it “the Naperville meeting.” This year’s edition, which took place on October 9–11, was the 21st, the first 16 or so having been hosted by Martin Lofton, proprietor of Sunshine Models. As always, the clinic schedule was full and generally very good. We also had another iteration of the “Friends of the Freight Car Dinner,” with this year’s speaker being Ben Hom. 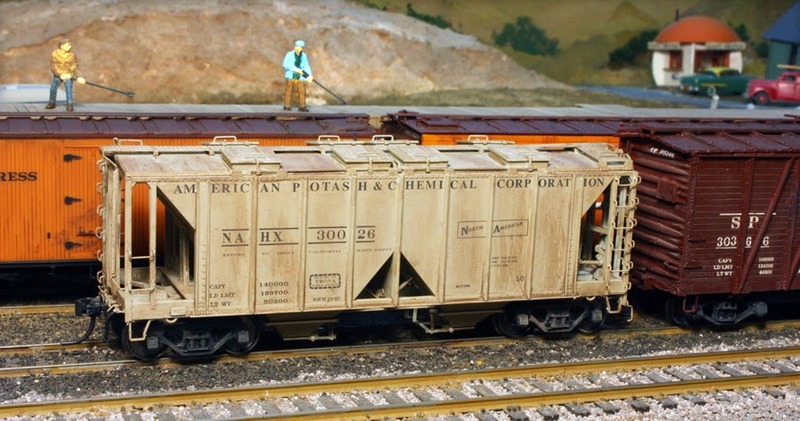 Ben spoke about where freight car modeling has been and where it is going, in the framework of the New England, Berkshire & Western model railroad club at Rensselaer Polytechnic Institute, of which Ben is an alumnus. It was a good talk and well received. In the photo below, Ben is at the podium in the front of the room, just about to begin his presentation. At the meeting banquet the following evening, I presented a Tribute to Richard Hendrickson, as I was invited to do by convention chair Joe D’elia. I added material to what is contained in my earlier blog post about Richard (see: http://modelingthesp.blogspot.com/2014/07/in-memoriam-richard-hendrickson.html ). I may put that added material into an additional blog post about Richard. Also, as is entirely usual and traditional, there was an excellent model display. I did not attempt to photograph more than a few impressive examples. Here is one of the models by Ed Rethwisch, clearly labeled as to origin; I liked the moderate paint failure depicted on the roof. Another set of excellent models was contributed by Aaron Gjermundson. He also showed a good description of each model in a list alongside his display, and a few prototype photos in the foreground. One of the long-time stalwarts among the various dealers and vendors who come to this show is Bob Liljestrand, doing business as Bob’s Photo. 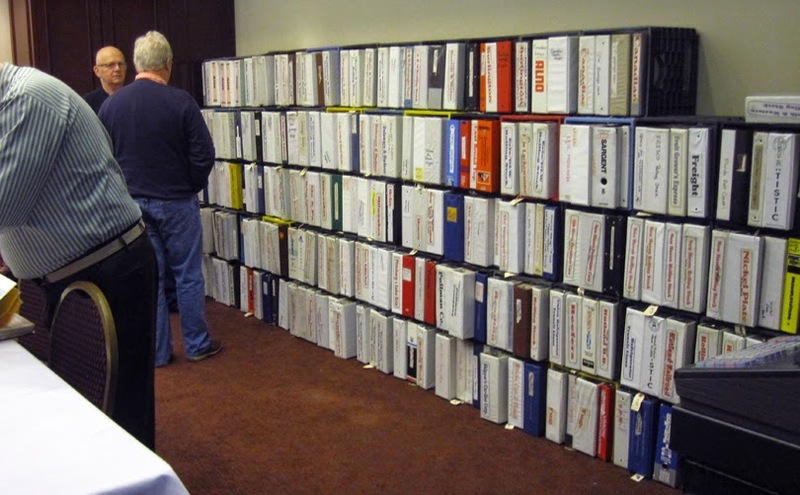 Here is part of the photo resources available for inspection, binders filled with 8 x 10-inch prints, a truly impressive amount of material. Finally, I will mention that I always enjoy it when I am lucky enough to have an invitation to operate on one of the many fine layouts in the area. This year I was able to join the operating crews at both Bill Darnaby’s and Bob Hanmer’s layouts. At Hanmer’s I switched the paper mill. Behind me, at one point, were Great Northern ore trains on both the upper and lower levels (the yard at bottom is Gunn Yard). All in all, another fine Naperville (or Lisle) meeting, structurally well done and well attended, but particularly good for meeting old friends and sitting down to talk, maybe even to have a beer or two. In the previous Part 6, I described weathering of flat cars and covered hoppers, and also provided links to the first five posts on this topic, which presented my basic weathering method. Part 6 can be seen at this link: http://modelingthesp.blogspot.com/2014/10/my-acrylic-weathering-method-part-6.html . In this post I take up open-top cars such as gondolas and hoppers. For them, I once again prefer to weather in two sessions, once to do the outside of the car (sides, ends and trucks) and again to do the inside. Insides are often different in wear patterns, degree of rust, debris, and other factors. The rest of the basic method is about the same. I will begin with a kitbash I did some years ago, following a Richard Hendrickson article in Prototype Modeler magazine (“Mill gondolas and how to model them,” Part 2, Vol. 5, No. 8, November-December 1982, pages 12–16; Part 1 was in the preceding issue, September-October 1982). It’s an EJ&E gondola modified from an Athearn model with fishbelly sides cut off, and given new, correct ends (from Detail Associates), a lever hand brake, and a wood floor. It was also necessary to add rivet-impressed styrene overlays inside the car to add rivets there (today, this would be far easier, and look better, with the use of Archer rivets). You can click on the image to enlarge. As you can see, there is some yellow rust streaking on the inside of the sides, along with some red rust, and the wood floor (represented with scribed styrene) has been weathered much like the flat car decks shown in Part 6 (link provided above). Another example is a model upgraded from the old metal Model Die Casting low-side gondola, which has a steel floor. These cars naturally took a beating inside, as do most gondolas, and in this model you can see the extensive rust. You can also see some debris inside. Many receivers of cargoes shipped in gondolas or flat cars simply left dunnage and bracing remnants on or in the car, and viewing prototype gondolas today still shows this kind of debris. The way to represent rust, as I’ve said before, is to use Raw Sienna (yellow rust) and Burnt Sienna (red rust), along with Burnt Umber (older, brown rust), again in the form of the usual washes. A car type which took particularly hard use, in fact comparable to hopper cars in some ways, was the General Service or GS gondola in the West. 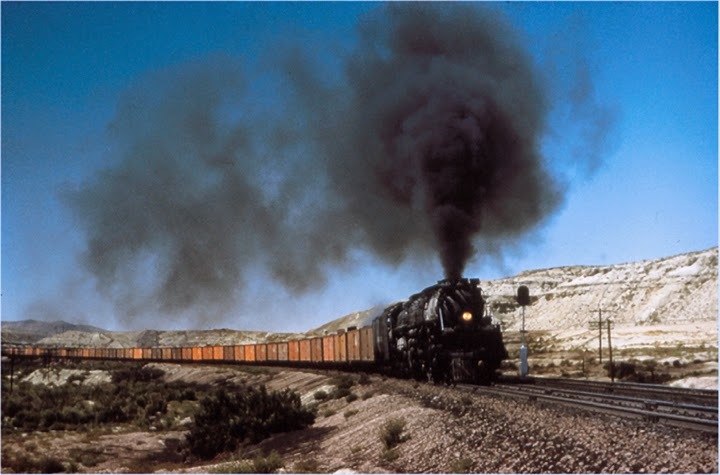 Most western railroads rostered substantial numbers of GS gons instead of traditional cross-dumping hoppers, and used them for a wide variety of cargoes, not least mineral and sand/gravel cargoes. Here is an example of interior rust and dirt added to a steel SP GS gondola. The interior looks visibly different from the exterior, as it should. 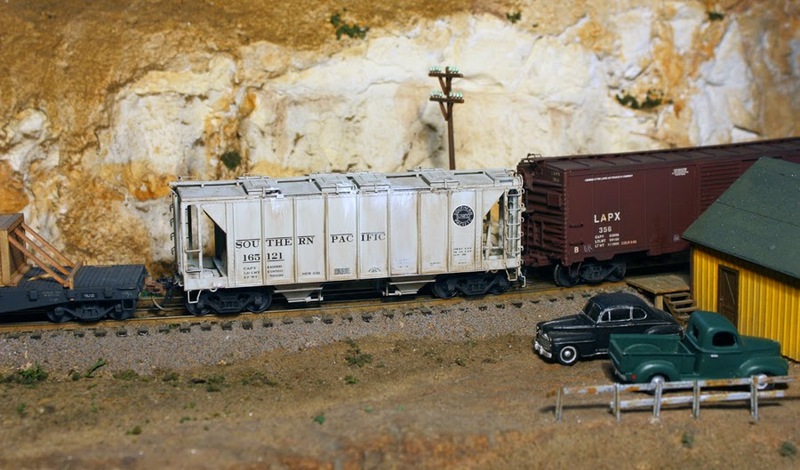 As a modeler of a western railroad, my interest in, and modeling of, hopper cars is at a pretty low level. I mostly have GS gondolas on my own roster. But I do have a couple of hoppers that may be of interest. First is a War Emergency twin hopper. These cars were wood-sheathed to save scarce sheet steel in the early part of World War II. 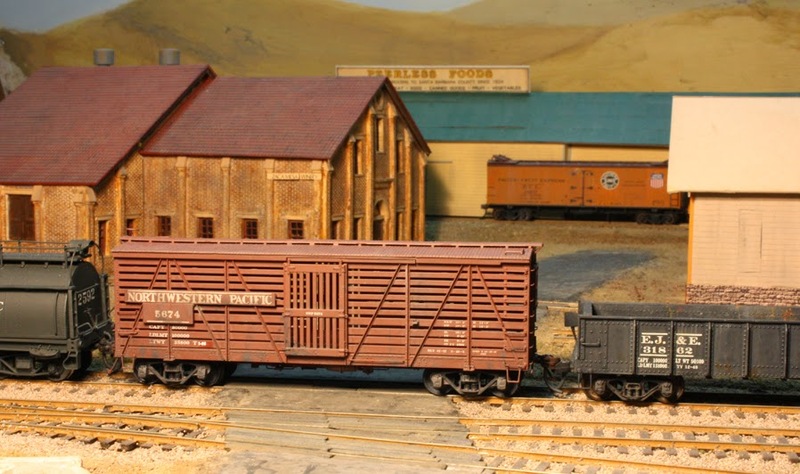 Some of them survived into the 1950s on the Santa Fe with their original wood sheathing, and the model shown below is Richard Hendrickson’s weathering. (He gave me the model, with its limestone load permanently installed, because he had done two models like this, in his view one more than he needed.) Artist’s color pencils have been used to give individual boards a little contrast and fade, and lettering is also faded. The overall effect is quite nice. One conventional hopper I do have is an old Ulrich metal kit, which has separate ladders and wire grabs. It is not too bad a match for some cars owned by the Montour. When I moved to Pittsburgh in 1977, the Montour was shutting down and a lot of equipment was on the scrap line. The weathering and rust in the image below is based on a photo of one of the cars I saw there. In regular service, coal can be abrasive to paint and rust alike, and probably the car interior would not have looked quite like this. These different open-top cars give some idea of the kinds of approaches which may be useful for your own fleet, depending on what (and where) you are trying to model. In a previous post I described part of a two-week visit my wife and I made to Ireland in September. A description of the Dublin part of that visit is at this link: http://modelingthesp.blogspot.com/2014/09/a-visit-to-dublin.html . A couple of days after that trip ended, we were to start another week’s visit to Barcelona, Spain. We could of course have just gotten a plane flight from Dublin to Barcelona. But we thought we could probably do something more interesting. Here’s what we did. First, we did depart Dublin by air, flying across the Irish Sea almost due east to Manchester, in the center of the English Midlands. The Manchester airport has a train station literally on the airport grounds, and has frequent service to a number of nearby cities. We took one of the hourly trains further east, to York. 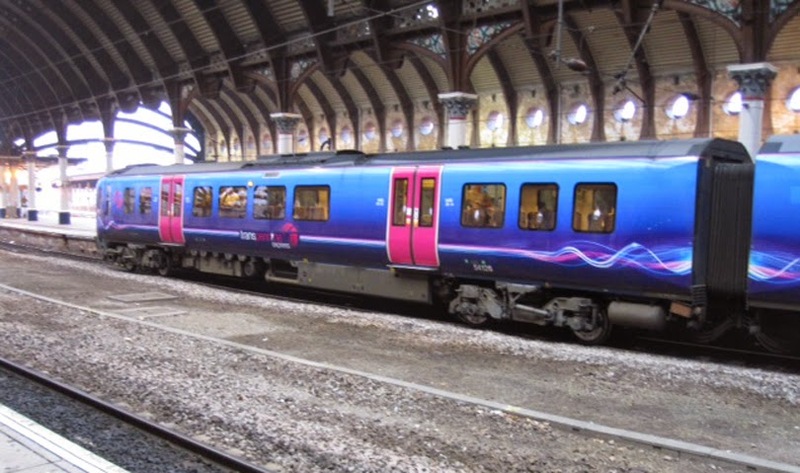 Britain today has a number of passenger service companies using the various rail lines. We took the Trans-Pennine express service. Here is the first car of the three-car train, all diesel multiple units. The equipment is shown in the York train shed. The train was nicely on time to York, giving us all afternoon to visit the National Railway Museum there, which in my view is the finest railway museum in the world. (Probably I will have more to say about NRM in a future post.) After a fine dinner at an establishment with the unlikely name of The Slug and Lettuce, we spent the night in York, and in the morning boarded a train of another company, East Coast Trains, to ride the East Cost main line to London. 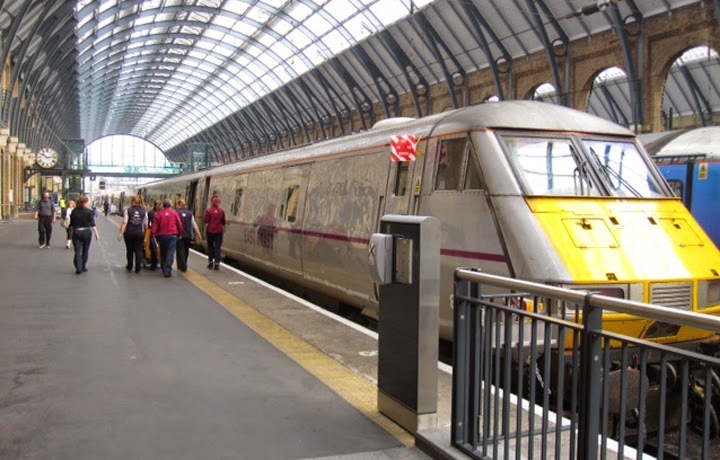 The train made excellent time and had only one stop before reaching Kings Cross, London. Here’s the electric loco in its East Coast gray livery, with a maroon stripe, shown in Kings Cross. Kings Cross and the adjacent St. Pancras station have been greatly modernized and expanded, a pleasure to see for those who remember these stations as kind of dirty and run-down. We had a quick snack in the new part of St. Pancras, then boarded our Eurostar equipment for a trip through the Channel Tunnel and on to Paris. This is amazingly quick, and the Chunnel part is only 35 or 40 minutes out of a non-stop trip of over two hours. 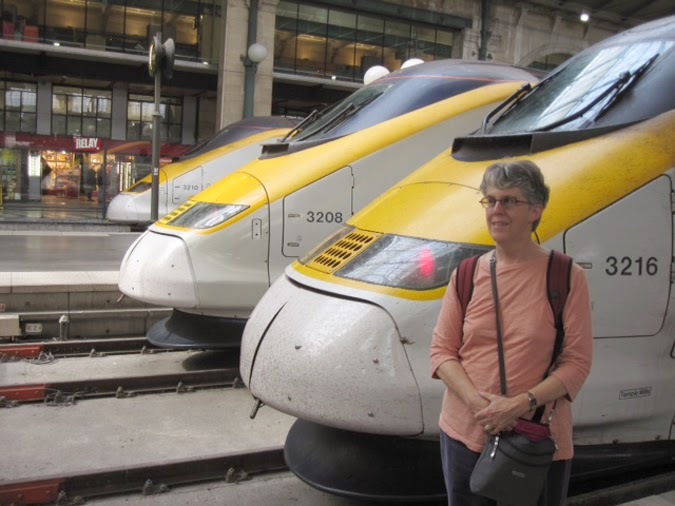 Here is Mary standing by several Eurostar trainsets at Gare du Nord in Paris. The nearest one is the one on which we had just arrived. As I said to Mary, the bad part of this trip plan was that we were forced to eat dinner in Paris. One of my favorite cities anywhere, the food is only part of the attraction of Paris, and we had a great meal before returning to our hotel. The hotel had been carefully chosen to be half a block from our departure station in the morning, Gare du Lyon, from which our train would leave at 7 AM. We had about a six-hour trip to Barcelona at TGV speeds, a marvelous way to see the French countryside, one of the loveliest landscapes anywhere. Mary had the foresight to reserve seats on the upper deck, so the view was excellent. The train doesn’t stop until far in the southwest of France, at Nimes and Narbonne, before crossing the border into Spain. 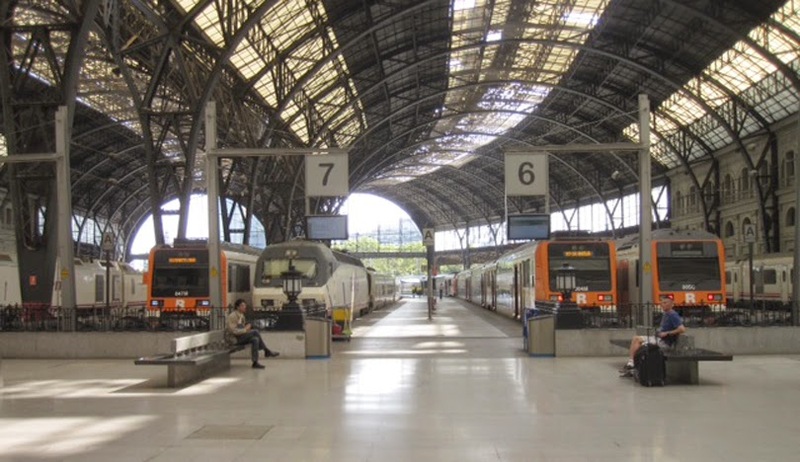 The TGV arrives at Barcelona’s Sant Station, a fairly clunky depot, but downtown we visited a depot of the old style, Estació de França, with a classic facade and train shed. Not only that, but the train shed is built on a curve (as is York). Here’s a shot from the concourse. A fascinating feature of the depot is an HO scale model of the interior, showing rooms in the structure and also a variet of trains posed on the shed tracks. It is displayed in the concourse. We had a great week in Barcelona, a marvelous city we had not been to before, but little of it had to do with trains. We learned a lot about Catalonia and how it’s different from most of Spain, had some very good meals, and (our actual purpose in making the trip) saw a lot of the art and architecture of the city. Many think of Picasso and Miro as French artists, or maybe as Spaniards, but Catalonians are very proud that in fact both were from this region of Spain, and there are superb museums for the art of both of them. And the Art Nouveau buildings in Barcelona, probably the most numerous in any city in Europe and climaxed by many structures by Antoni Gaudi, were a real highlight for us both. A terrific trip. 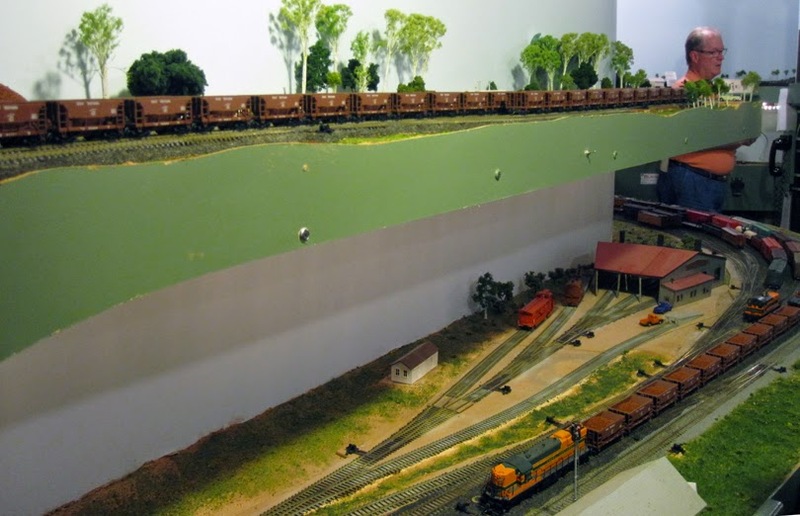 In the October 2014 issue of Model Railroad Hobbyist (MRH), my column in the ongoing, multi-columnist series, “Getting Real,” is about making a timetable for model layout use. As with all issues of MRH, the magazine is free and can be downloaded from the MRH site, http://model-railroad-hobbyist.com/magazine/mrh-2014-10-oct . Since I model the Guadalupe Subdivision of Southern Pacific’s Coast Division in 1953, my timetable was built with the idea of looking as much like the prototype ’53 Coast Division employee timetable as possible. I used the prototype front cover, part of the back-cover map, and the correct Guadalupe Sub timetable pages (inserting my mythical junction town of Shumala). Using information from the SP booklets, “Through, Manifest, Merchandise and Perishable Freight Schedules Between Principal Points” (shown in the column), I added condensed freight train schedule and car handling information in the front of my model timetable, and using the actual Coast Division “Special Instructions” document (also shown), I placed some condensed rules in the back of my timetable. I should emphasize one point. The addition of rules in the back, and freight schedule information in the front, does not mimic an actual employee timetable, but does incorporate elements of prototype information from other sources, and gathers them into a single timetable for layout use. The “center spread” of the timetable does show the prototype scheduled trains and times at intermediate stations on the Subdivision. I also added schematic town maps to the timetable. Like some of the foregoing ideas, I discussed this idea in a previous post (you can see it at: http://modelingthesp.blogspot.com/2013/10/setting-up-operating-session-creating.html ), but did not go into much detail. In the column, however, I did address the construction and use of such maps. I have used two Adobe applications to make these maps, Photoshop and Illustrator, and both can do a nice job. To show one of these, here is the map for East Shumala (what my blog posts about construction have called the “Shumala Extension”). I made this one with Photoshop. You can click on the map to enlarge it. Note that there are numbers at two of the industries for specific car spots, that there is a specific requirement for car spotting at Caslon Printing, and that surface roads are shown also for orientation. To give an idea of the completed document, here is the inside front cover and first (right-hand) page, shown being used at Shumala. All this and more is described in the column. My maps for Ballard and Santa Rosalia (towns on my branch line) are in a state of flux, because final locations have not been chosen for some industries, and there is even a little track left to lay. That’s the beauty of making digital maps: they are a lot easier to modify and update than draftsman’s masterpieces with pen and ink. This Part 6 is about car types beyond tank cars and simple house cars. Links to prior parts of this series are listed below. The first three parts described the basic method, and subsequent parts presented (and will present) specific car types or specific effects to be achieved. Note also that the deck is pretty beat up. Few modelers reproduce either the dark colors or the damage to the deck. The photo above admittedly shows a car later in its life, but it does depict the direction that deck appearances are headed. And by the way, the SP did not creosote decks of its flat cars, nor did it paint them, so the color shown did not arise from those reasons. This means that raw “real wood decks” on model flat cars can only represent a just-installed deck, which would be a rare observation. 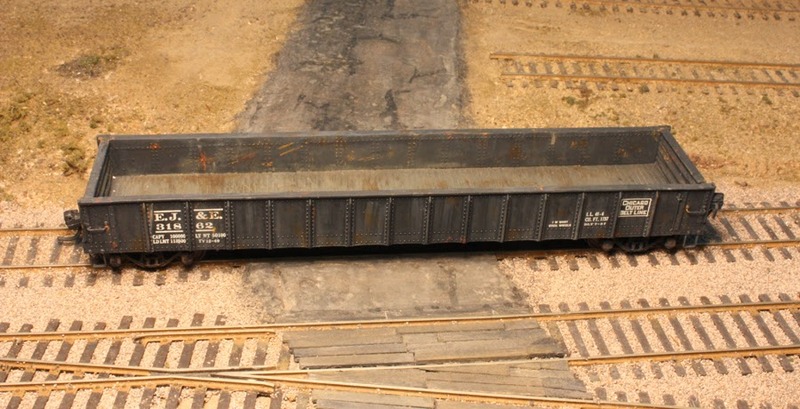 To illustrate, on Otis McGee’s layout, which rosters about 75 SP flat cars for lumber loading, there is only one car with an unweathered deck. For these cars, I paint with acrylics, rather than use washes, although the same colors are used as shown in Part 1, link above. Shown below is a photo from my previous post on decks (link in previous paragraph) to show both “real wood” and plastic decks, as modified. A related problem arises with bulkhead flat cars, for which there is both a steel body and bulkhead frame, and a wood deck and bulkhead facing. This is one of the bulkhead car models, produced by the Southern Pacific Historical & Technical Society, of the 1949 home-built SP modifications to Class F-70-7 flat cars. I weathered the body with washes, the deck and facings with paint. Another car type that presents its own problems is the covered hopper. In the early 1950s that I model, these cars were almost entirely used in cement service. It was not long before spilled cement from the loading process accumulated on roofs and trailed down car sides. That’s shown here with some dry-brush streaking with acrylic Titanium White, about the only time I ever would use white, and even here, I mixed in a little Neutral Gray to tone it down. There is also some brownish dirt on the car, but it is not very heavy, as this car was built in 1951 and I am modeling 1953. 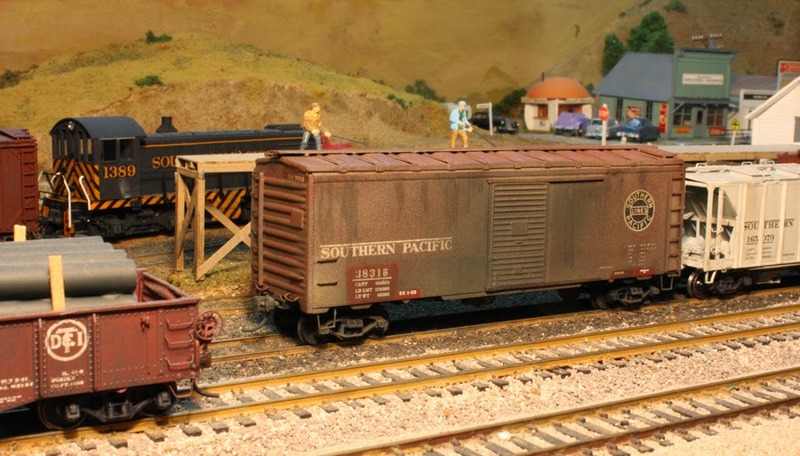 The model is an InterMountain product, and like nearly all of SP’s 1950s covered hoppers, has “closed” sides. You can click to enlarge. But despite the predominance of cement cars, there did exist covered hoppers in other service, including chemical and mineral service. 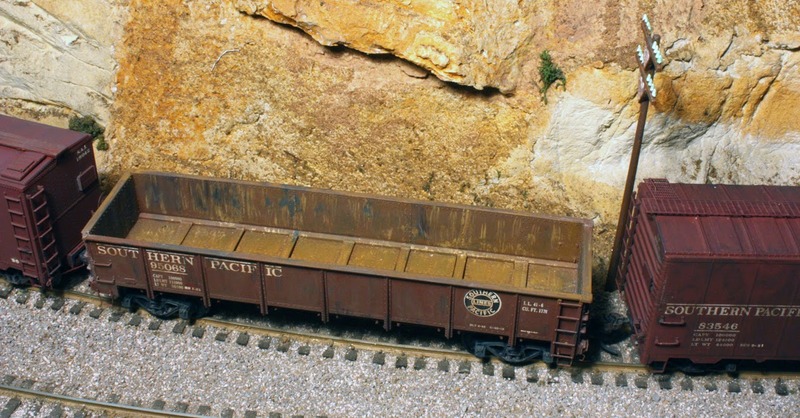 Here is an example, a car leased to American Potash and Chemical, and assigned to haul the mineral trona; it’s an InterMountain model with open sides. Both these cars were weathered as house cars, that is, the roof was weathered in one session, then the sides and ends were done in a subsequent session. Other car types have challenges of their own, and deserve separate treatment. I will take up gondolas and hopper cars in a future post.